Ben Kingsley's channeled Mohandas Gandhi so deeply that it's difficult to view pictures of the sainted Indian leader without thinking of the actor. Columbia Pictures/Everett Collection. Ben Kingsley as Gandhi, 1982. Stars: Ben Kingsley, Rohini Hattangadi, Candice Bergen, Martin Sheen, Roshan Seth. Ben Kingsley’s channeled Mohandas Gandhi so deeply that it’s difficult to view pictures of the sainted Indian leader without thinking of the actor. 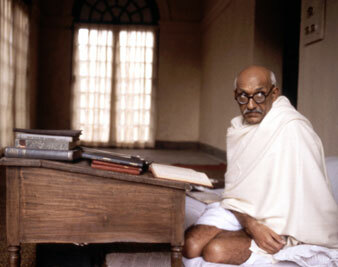 Richard Attenborough’s Gandhi is every bit as sumptuous as everyone had expected. Years in the making, it is performed on a stage that spreads across two continents and deploys a cast that may well number in the thousands. Like Lawrence of Arabia, with which it is being compared, it celebrates a hero who combined intense spiritual ardor with a flawless command of showmanship, and it sweeps with steadily rising momentum through scenes that vary in scope from panoramic uprisings of mass passion to intimate clashes of will and poignant domestic interludes. Ben Kingsley, a Eurasian actor of evident intelligence and impressive power, reaffirms the Mahatma’s legendary courage, moral purity and steadfast vision, and adorns these virtues with an ironic quickness of wit and a simple gaiety that add a beguiling humanity to Gandhi’s popular image. He is well supported by Indian and English actors and actresses who will be largely unknown to the American public, and in particular by the trio of John Gielgud, Trevor Howard and John Mills, once again playing stalwart servants of the expiring British Empire. The cast also includes Candice Bergen, Edward Fox and Martin Sheen. High school students are being taken to the movie in squadrons, and they appear to watch it with rapt attention Since for many of them it will be their introduction to one of the half-dozen most influential men of our century, I suspect that henceforth they will think of Gandhi as the tragic hero of a thrilling historical drama. For Attenborough’s picture is another cinematic hagiography, an approach that has been applied successfully to such various figures as Emile Zola and Sigmund Freud, George Patton and Clarence Darrow. Paradoxically, Gandhi‘s subject was too grand for such grandiose celebration. On its own terms, the movie is an unqualified triumph, but it is much broader than it is deep. The demands of popular spectacle make it an exercise in awe, turning Gandhi into a star attraction.